Whenever you are writing a story using our editor, you are working on the current version. 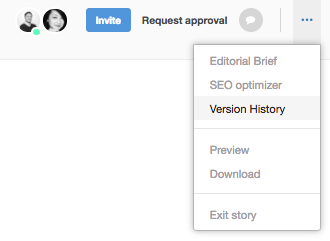 If you go back or you refresh the page or you invited a colleague to work on the article, every time there will be a new version kept in 'Version History'. You will know perfectly who did what and when, and restore a previous version if needed. Click on a version: words or sentences in green are added, whereas words or sentences in red are removed. Same goes for media files, such as pictures, videos, tweets and comments in the background.